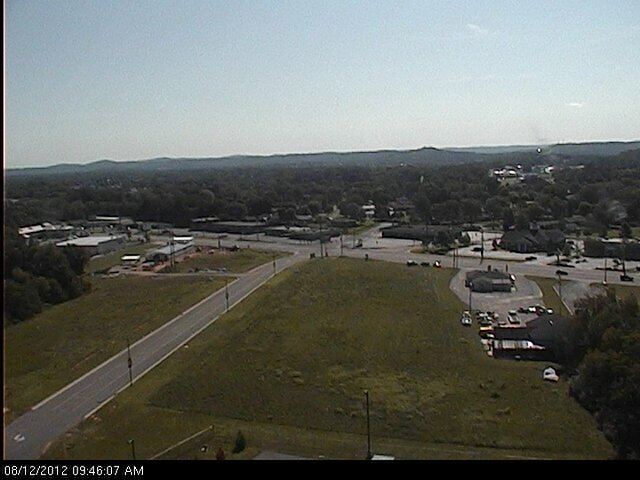 A very cool start across the Cookeville area this morning as temps were in the 50's for the second morning in a row. We dropped to a low of 52.7° (the record low was 49° in 1964), which is the coolest morning reading since the sixth of June when we had a low of 50.6°. Expect Sunday highs under sunny skies (see this morning's web cam shot above) to be around 83°, which is about 5° higher than yesterday's 78.5° maximum. It was just the third day this summer we hadn't been in the 80's, 90's, or 100's. Our work week will begin with a slight chance of storms on Monday with a better chance on Monday night and Tuesday. Expect warmer temperatures on Monday with highs in the mid-upper 80's and muggy-like conditions. After frontal passage on Tuesday, we'll be back down in the comfortable range (much like this weekend) and then temperatures heat up for the end of the upcoming week. By the weekend however, another front brings cooler weather once again.